When I was a child I always said I wanted 9 children. In fact, I said I wanted 9 boys! I would tell people I wanted my own baseball team, not a softball team, a baseball team. Family was important to me and I hoped and prayed that one day I would find someone who would love me enough to want to marry me and start a family with me. I was very fortunate to begin dating my husband in high school and to marry shortly after we graduated. We added to our little family just two years later when our daughter Kaylie was born. I loved my little family. Sure, there were ups and downs but I was happy. I was right where I had always prayed to be. As the years progressed and my husband and I worked out our roles as both parents and spouses, I began to feel like I was losing myself. Sure I had gone to college, I had worked outside of the home, and ultimately I made the choice to stay home with our children, but I found that often people only referred to me as just a wife or just a mother. I wanted to shout, “I am Michelle! Can’t you see me?” Resentment invaded my heart. Why was it that Mike could be seen as more than just a husband or father, but I couldn’t be seen as more than just a wife or mother? It didn’t seem fair. I don’t know what happened to change my heart, but one day I realized how silly I was being. After all, wasn’t I the one who dreamed of being a wife and a mother? Wasn’t I the one who claimed that her family was her reason for living? Wasn’t I the one who prayed daily that God would bless her with more children and a deeper, loving relationship with her husband? Why did being a wife and mother take away from who I was? My husband and my children filled every space in my heart and every minute of my day. I lived for them. I cherished them. I thanked God each and every day for them. I realized that my vocations as a wife and mother completed who I was. It was a startling discovery. It wasn’t that I didn’t do my job as a wife and mother before that point. I did; and I did it well. But after I realized that my vocations as wife and mother were more important than any other aspect of myself, I found that I had a desire to do better. I wanted my husband and my children to be proud of me. More importantly, I found I wanted God to approve of the wife and mother I was becoming. This meant I had to let go of me so that He could mold me and make me into the woman He desired me to be. It was the easiest, and the hardest, choice I have ever made. 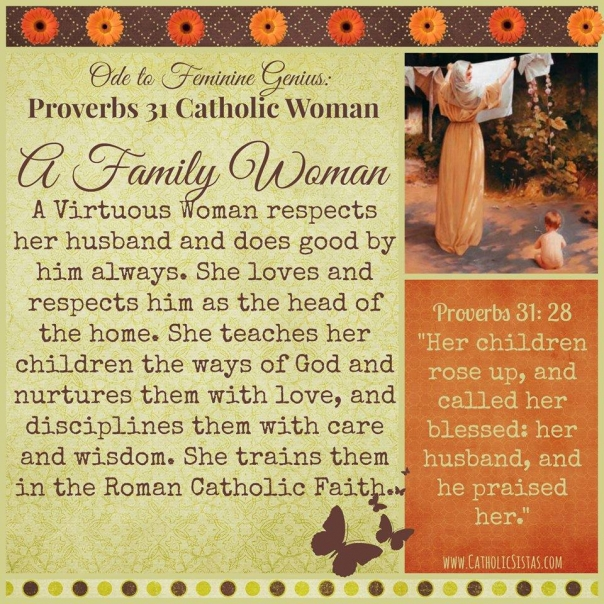 The Proverbs 31 woman does well by her husband. She respects him as the head of her home. While I had always respected Mike, I don’t know that I had allowed him to become the head of our home, the head of me. When I decided that my vocation as wife and mother was the most important calling in my life, I decided to actively submit to my husband. When we talk about submission we are often faced with criticism that no man should ever “rule” over us and that as women we are strong and should stand on our own. Submission in marriage doesn’t mean that the husband rules over his wife. In fact, more often than not you find just the opposite. You find a greater amount of cooperation and trust. You find spouses working together to make decisions that will affect the family. You find mutual respect and love. Submission often equals greater satisfaction within your relationship. But what does it mean to submit to my husband? When I submit to him there are certain things I do to make sure that I am honoring him and holding him up as the head of our house. I encourage him in his work and in his fatherly duties. I speak highly of him to our children and to our family and friends. I never talk badly of him to others. I respect his views and his thoughts and consider all that he says with an open heart. I truthfully share my thoughts and opinions with him knowing that he also respects my views and wants to know what I think. I trust that he has our best interests at heart and when I am not sure that we are making a right decision, I trust him to lead us down the right path. I try my hardest to do nice things for him that will bring him joy and peace. I do not deny him any part of myself- my time, my attention, my thoughts, my heart, my body, or my love. What I have found is that when I submit to my husband, he in turn submits his heart to me; he loves me the way Christ loves His church. 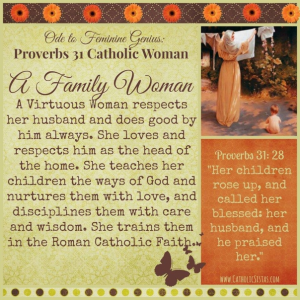 But the Proverbs 31 woman doesn’t just respect her husband. She also loves her children and nurtures them. She teaches them the ways of the Lord and trains them in the faith. She is a model of love and wisdom. Perhaps this is the harder role of the family woman. What a tremendous task to set out to accomplish! As I began to see that my role as a mother didn’t preclude me from being Michelle but actually made me a better version of myself, I could see just how important my role was in my children’s lives. I knew that I had to take it seriously. But how could I make faith an important part of my children’s lives? How could I be a model of love, wisdom, and care? I started out the best way I knew how: I took my children to church. I made the decision that church was important and that meant we needed to go. And so, we went. I often had to go alone and I often wouldn’t hear the Gospel or the homily and would be sweaty and tired by the time Mass ended. But, each Sunday I was there I prayed that God would accept my offering and know that I was doing my best. The graces I received were innumerable. They spilled over into my everyday life. I was able to bring our faith into our everyday lives as well, centering our family around God and His promises. I had more patience and more hope. I found peace in the mundane and joy in the hardships that accompanied motherhood. I saw joy and peace spread into my children’s hearts as well. Their eyes sparkled and their laughter rang through our home. I felt fulfilled. I felt that my life was exactly as God had planned. My vocation as a wife and a mother helps to make me Michelle. My family helps me to be the best version of myself that I can be. They help me to see the good in life. They help me to call on God when times are tough. They help me to trust and to love in ways I could never do on my own. When I take care of them I am rewarded in ways I could have never imagined. When I fall short of my calling we are all affected by those shortcomings. While I am not perfect by any means and fail more often than not, when I try to do my best my family thrives. I thrive. When I focus first on my family I become a better version of myself than I could ever be on my own and I uphold the calling I willingly accepted when God invited me to enter into family life. I become as much of a blessing to my family as they are to me. Michelle Fritz is a daughter of God, a cradle Catholic, a devoted wife of 20+ years to amazing husband Mike, eclectic homeschooling mother to eleven wonderful children. She has experienced the loss of 13 babies in her call to be open to life, but knows that God is always loving and always gracious. She and her husband know that they have an army of Saints already in heaven! They try to show their faith in everything they do and hope that all who come to know their family, also come to know the Lord. Hang Up the Phone and Play!